North Pacific in Origin Low not as bright than from the South Atlantic. January 22 2015, photo with moon, had clear air very similar to Dec 25, 2014. December 25 sun elevation was -13.12 degrees, while January -13.09 degrees, but had twilight brightness well below December 25 2014 Santa storm shine despite somewhat similar mega scale weather. at many such interfaces can get diverted like a laser light through fiber optic line, and travel beyond the earth's terminator, the edge between light and darkness separating night and day as seen from space. In the High Arctic at present it is dark, but a twilight exists at noon. This twilight changes in intensity due to the position of the sun below the horizon, the extent and type of clouds, pollution or natural aerosols, and finally how much refraction there is in the lower and mid lower atmosphere where normally the Arctic Air is warmest in darkness. Confirmation of Pressure system driven light variations due to atmospheric refraction. ~please read the Christmas article just below, this is a follow up. December 25 2014 (left), was visually brighter than January 9 2015 (right). The sun elevation was -12.07 and -12.12 degrees. On camera , the visual perception was confirmed. With exact camera settings and location in both instances. A bit later, December 25,2014 (left) and January 9,2015 (right) appear similar, but there are large differences. First the hills appear higher on Dec 25, this may be an illusion due to brightness. Second , despite January 9 more sparse lower clouds, there appears far less redness, a feature of the raised horizon, purely a refraction and scattering phenomenon. If there were more aerosols on either photo, the red would have appeared hazed, or more uniform , but instead it was layered in refraction dispersion colors. light appears. Finally Dec 25 sun elevation was 0.3 degrees lower than on January 9. January 9 had very clear air, especially cleansed by a 2 day blizzard, and the temperature was colder over he same wide area light has travelled. Colder air gives stronger refraction without ducts. Since before December 25, several Atlantic North-easterner Cyclones have merged into a greater huge sub Polar vortex roughly centered over Greenland, affecting weather over a vast areas spanning from Arctic Eurasia, Scandinavia all the way to mid-west USA. Since Christmas, the temperatures dropped significantly over most of North America, with temperatures higher in he High Arctic. Clearly a reversal in contrast has occurred, instead of a wide deep in dT macro interface as on Christmas, dT were largely diminished. Pressure systems were equally not entirely similar, December 25 had a large intrusion of warm air spanning westwards past Hudson Bay. January 9 light path Cyclone was not so significant East of Hudson Bay. A very similar prognosis to Dec 25,2014, misleading because temperature Upper Profiles were very different. 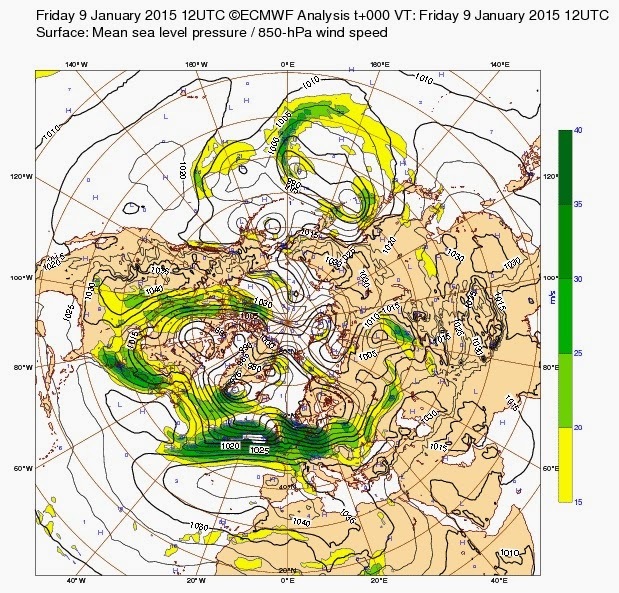 The Polar Vortex had 4 components, in 2 small anticyclones amidst 2 larger cyclones. The biggest Low centered over Greenland basically a sub-vortex covering half the North circumpolar world. refraction method, this time in judging the magnitude of Cyclonic systems.